The microbes could surrender to the harmless virus, but instead freeze in place, dormant, waiting for their potential predator to go away, according to a recent study in mBio. 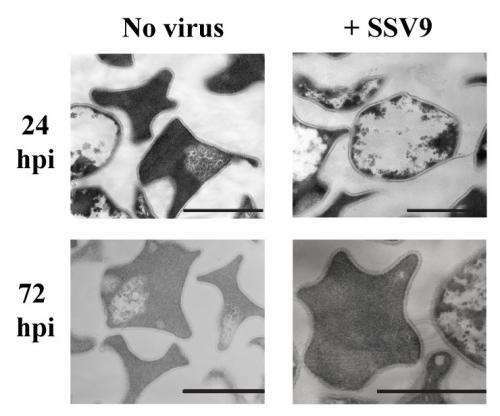 University of Illinois researchers found that Sulfolobus islandicus can go dormant, ceasing to grow and reproduce, in order to protect themselves from infection by Sulfolobus spindle-shaped virus 9 (SSV9). The dormant microbes are able to recover if the virus goes away within 24 to 48 hours—otherwise they die. "The microbe is hedging its bet," said Associate Professor of Microbiology Rachel Whitaker, who led the research at the Carl R. Woese Institute for Genomic Biology. "If they go dormant, they might die, but we think this must be better than getting infected and passing it on." Sulfolobus is a species of archaea (a domain of single-celled organisms distinct from bacteria) found in acidic hot springs all over the world, where free viruses are not as common as in other environments. These microbes will go dormant in the presence of just a few viruses, whether active or inactive. While inactivated virus particles cannot infect a host, Whitaker's lab found they could still cause dormancy, and ultimately, death in Sulfolobus. "People thought these inactivated viruses were just an accident, that they were just mispackaged," Whitaker said. "Now we know they are being sensed by the host so they are having an effect. People are starting to think that it is adaptive for the virus to produce inactivated virus particles." Sulfolobus have an adaptive immune system found in archaea and bacteria that allows the microbe to encode a specific piece of DNA that matches the viral DNA, causing it to target the viral DNA and degrade it thus preventing the virus from propagating, or reproducing. Cultures with immunity to SSV9 recover from dormancy and grow normally once the virus is removed from the culture. Microbes without this immunity are susceptible to infection and eventually kill their neighbors by maintaining viral particles in the environment. The researchers do not know exactly what is going on while the microbes are dormant, only that the microbes look drastically different in that state. More research is needed to better understand these new interactions between microbes and viruses. Incorporating these findings into models will show the true ecological impact of viruses in the microbial world, Whitaker said. "We really don't understand the way that viruses affect microbes," Whitaker said. "There is a lot to learn. These communities are usually modeled where a virus will either kill the microbe or the microbe is resistant. But actually there are all these other subtleties going on, like dormancy, that are having a bigger impact than we understand." Dormant microbes are found everywhere, in water, soil, and even the human gut, said Maria Bautista, a graduate student in Whitaker's lab, who led the research. "Many microbes go dormant when they face environmental stress such as a change in pH or temperature " Bautista said. "Maybe virus-induced dormancy is something that doesn't just happen in Sulfolobus; it may be a widespread response to viruses in other environments. We don't know." "These microbes will go dormant in the presence of just a few viruses, whether active or inactive. While inactivated virus particles cannot infect a host, Whitaker's lab found they could still cause dormancy, and ultimately, death in Sulfolobus." Can you use inactive virus to control bacteria while you use it (bacteria) as a cure for any life threatening disease?